Even if you didn’t know any of its history, the Speedmaster would still be a highly desirable watch. In a world of hyperbolic marketing around luxury timepieces, here’s a watch that is literally otherworldly. Sure, like the Rolex Daytona, it combines a design that is both classic and contemporary with seriously impressive mechanics under the hood. It also looks and feels reliable, a watch you can trust to last. However, what the Speedmaster has that few brands do (although many claim to), is space – or more specifically the Moon. And that is just one of the things that takes this particular sports chronograph into another stratosphere. As a marketing tool it never gets old: “the first watch on the Moon”. It’s pretty much the ultimate horological pick-up line. If you want a watch that combines adventure, old-school masculinity and exacting technical standards, a NASA seal of approval is hard to beat – though even that didn’t stop the story getting a little embellishment. Until recently it was thought that a member of NASA went into a Houston jewellers to purchase watches to test, one of which being Omega. The truth is more prosaic. 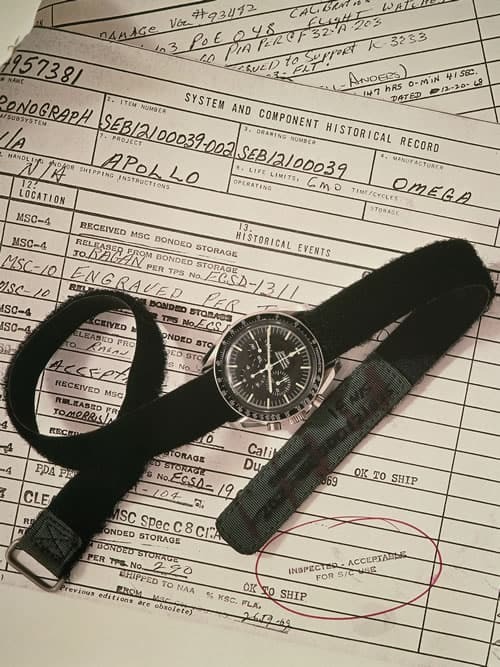 The Speedmaster was known to NASA thanks to astronaut Wally Schirra, who wore a CK2998, the second iteration of the watch, on the Mercury Atlas 8 mission in 1962. When NASA decided it wanted to equip its astronauts for the Gemini programme with watches that were to act as a part of their tool kit, it appealed to brands to send in models for testing. Eventually only three watches were tested: a Rolex Cosmograph ref.6239, a Wittnauer (Longines) Genève Professional Chronograph 242T, and the Omega. Hamilton sent a pocket watch but because it didn’t match NASA’s criteria, it wasn’t submitted for testing. As the watch was going to be worn outside of the space suit, the process had to be rigorous. It was tested at high temperature, spent four hours at -18°C, underwent temperature and pressure oscillation tests, as well as humidity, shock, oxygen atmosphere and acceleration checks. It was also subjected to decompression, high pressure and vibration. After all this, the Rolex stopped running on two occasions; the crystal warped on Longines and came loose during the high-pressure test; but all that happened to the Speedmaster was a gain of 21 minutes during the decompression test, a loss of 15 minutes in the acceleration test and a deterioration of luminescence on the hour markers. Duly certified, it was first issued as standard equipment for the inaugural Gemini flight. But it was its selection for the Apollo programme that sealed its fate. On the wrist of Buzz Aldrin, not Neil Armstrong, who had to leave his in the lunar module due to a malfunction of one of the timekeeping instruments, it became the first-ever watch worn on the surface of the Moon. Partly because of the watch’s history, the movement that keeps it ticking has itself attained legendary status, and Omega has been reluctant to tinker with it over the decades. That said, there have been three iterations of movement in the Speedmaster. The first was the Lemania-based Calibre 321, which has a column-wheel chronograph. As the Speedmaster became more popular Omega opted to up production and cut costs by changing the column-wheel to a cam-actuated chronograph, which is easier to make and maintain, for the also Lemania-based Calibre 861. Minor tweaks happened in 1997 and the Calibre 1861 took over. Yet the calibre 321 retains somewhat lauded status among Speedy collectors, partly because the column-wheel chronograph, which features a vertical clutch as opposed to a horizontally coupled chronograph, is a more technical way of operating this function, as opposed to the arms-and-levers construction of a cam, but also because it was only used for 11 years of the Speedmaster’s life making models that carry it extremely collectable. When it comes to servicing, Omega recommends you have your watch serviced every four-to-five years. At a recommended cost of £520 for a mechanical chronograph that might seem like an astronomical outlay, but this is something that is on your wrist daily, whose mechanics are whirring away, maintaining a mean rate of accuracy of +4/-6 over 24 hours. Work it out on a “cost per wear” basis over five years and all you’re doing is putting away ~£0.28 a day to keep this beauty ticking on your wrist for a lifetime. It is also a bargain when you consider what happens in a service. The watch is completely dismantled, and when we say completely we mean case, dial, hands and movement in its entirety, then assessed to see precisely what it requires. The case and bracelet are polished up to “just left the factory” standards and the pieces of the movement are checked to see which parts are worn and need servicing or replacing; if necessary the movement will even be upgraded to the latest model. Then there is more cleaning, washing and checking that the watch has been restored to Omega’s stringent criteria. Again, it makes just over £500 seem like a bargain. If you’ve taken the plunge and bought your coveted Speedmaster, chances are you will want to wear it every chance you get. However, as with any watch there are a few style rules and just because it costs the same as a second-hand car, that doesn’t mean it goes with everything. Given that this is a steel-bracelet sports chronograph, keep your wardrobe on the less formal side. It will work well with a relaxed but tailored look – think blazers with dark roll necks and contrasting trousers. Even better is rugged casual weekend wear: jeans, chunky boots and perhaps a heavy-duty duster with high collar. Just don’t – repeat don’t – wear it with a suit. “Here’s the rule to looking good now. Wide pants, big lapels and tiny watch. All that big watch [with a suit] stuff is embarrassing to see,” as men’s style writer, stylist and all-round sartorial guru Tom Stubbs so eloquently puts it. The great thing about the continued production of, and interest in, the Speedmaster is that you can’t go wrong in buying one and there are so many reputable retailers that you’re unlikely to get duped. If you’re buying new the only real consideration is if you’re purchasing with your heart or your head. If you’re hoping to make an investment then sticking with the Moonwatch series (no Mark IIs) and limited editions are the way to go, such as the Speedmaster 60th anniversary that was unveiled this year to commemorate the launch of the original. Anything with Snoopy on the dial – a reference to the cartoon beagle chosen by NASA astronauts as a mascot in 1968 – is also a sure-fire investment. If you just want to own a Speedmaster then spend as much as you can and take good care of it. The other benefit is these later editions will come with boxes and papers, which means you know you’re not buying a fake. The best way to avoid that is to fully research your seller but one easy tell is to look at the subdials – on the original the gap between them is minimal, but on fakes the gap will be much larger because they have the wrong movement in. If you’re still unsure get in touch with one of the many Omega forums as there will definitely be someone on there who can help. For sheer historical importance, the Speedmaster CK2915 has to have a place on the list. It didn’t go to the Moon but this was the 1957 Italian automotive-inspired sports chronograph that started it all. It was only around for three years, which is why it fetches fortunes at auction. Next has to be the Moonwatch and more specifically the reference that made it to the Moon – the 105.012. It’s NASA certified and its DNA lives on in the Speedmaster Professionals produced today. Quite simply, this is as cool and historically noteworthy as a watch gets. The Speedmaster ref.145.012 is another an interesting one. It still contains the coveted calibre 321 and was worn by more astronauts than any other Speedmaster but, because it didn’t land on the Moon, it isn’t as expensive as the 105.012. You’ll have to be patient and look carefully for these vintage models, but not all collectable Speedmasters are as rare as moondust. 2015’s Silver Snoopy is a Snoopy version that is still available, which makes a worthwhile investment. Created to commemorate the 45th anniversary of the aborted Apollo 13 mission, the first 14 seconds on the dial are highlighted with the words “What could you do in 14 seconds?” underneath in reference to the successfully timed correction course that allowed the team to get home. The colourways of the iconic Moonwatch’s design are reversed – a white dial with black markers – while the movement is a hand-wound 1861, which is the same as the Apollo 13 original, and on the back is another Snoopy dancing among stars. Lovely. If you want the closest modern equivalent to the original Moonwatch then the Speedmaster Professional Moonwatch ref 311.30.42.30.01.005 is the one to opt for. Nothing much has changed bar the movement going from the calibre 321 to the 1861 via the 861 and a few cosmetic tweaks, but this would be instantly recognisable to Buzz Aldrin and Neil Armstrong – and frankly anyone who knows about watches. As chances of getting your hands on the CK2915 are slim, the next best thing is this year’s homage the 60th anniversary edition of the Speedmaster. It is a straight-up reissue of the CK2915. It has the Omega applied logo, “Speedmaster” written in the same font as the original and no “Professional” mention as that was only introduced in 1964. A perfect slice of vintage that appeals to purists as well as first-time buyers. While it’s nigh-on impossible to compete with a Speedmaster, you couldn’t call it an uncommon choice for discerning wrists. Or you may simply not have that kind of budget. So here are five other stylish watches connected by cars or space to consider. Not much less in price but enforcing the Moon connection is this chronograph by Fortis. Fortis’s Official Cosmonuats’ collection has been part of the Russian Federal Space Agency’s equipment since 1994. This homage has substantial shock protection, a Valjoux 7750 and is water resistant to 200m. Bulova is a brand that did actually make it to the Moon – on August 2 1971, during the Apollo 15 mission. The watch that made it was its Moon Pilot Chronograph, which had been customised for lunar conditions by the brand’s engineers. This update contains its high-performance quartz movement and an interchangeable strap. Apparently, a certain four-lettered space agency has the legendary Victorinox Swiss Army knife as part of an astronaut’s tool kit. This white limited-edition I.N.O.X. with rocket scientist-approved paracord strap pays homage to a partnership that is very much off the record and on the QT. Moving away from the lunar connection and on to vintage-inspired chronographs, this Intra-Matic ‘68 from Hamilton is the business. An amalgamation of three watches – Chronograph A and B and the Chrono-Matic – that Hamilton launched in 1968, it has a fabulous reverse-panda dial and contains Hamilton’s H31 movement, a variation of the Valjoux 7750. It looks seriously cool too. Kickstarter success story Helgray is another option if you’re after something with the same automotive-inspired heritage of the Speedmaster’s design. It not only looks great, but it is powered by Seiko’s meca-quartz hybrid movement – the movement is quartz but the chronograph module is mechanical – which measures to fifth-of-a-second accuracy. And you get change from £300.